The proper governing of an electric screw air compressor will eliminate many breakdowns. 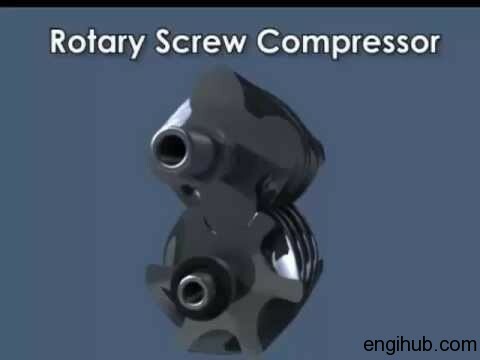 This post will definitely help you a lot if you are using screw air compressor or rotary air compressor in your engineering plant. Information shared in this article will apply to all screw air compressor. A compressor may be manufactured by Ingersoll Rand, Atlas Copco, ELGI, and Chicago Pneumatic, it doesn’t matter. An electric screw air compressor required proper governing to obtain the best performance. Hence I will like to share the detail steps for proper governing of the compressor. 01) Automatically unloads the compressor after starting. 02) Load/Unload the compressor at preset pressure limits to match the exact demand of compressed air. 03) Blows down the receiver to a lower pressure at unloading to save power. For the purpose of explanation, the unloading pressure is taken as 7.1 Kg/cm² and loading pressure as 6.8 Kg/cm². This is standard pressure on which many compressors working in engineering units. Before starting, receiver pressure is zero Kg/cm², hence starting cylinder plunger is extended by spring and servo cylinder plunger is retracted and butterfly valve is kept slightly open. Starting from receiver pressure zero Kg/cm² butterfly valve is slightly open, receiver pressure slowly increases to 4 Kg/cm². The blowdown valve is now closed. During the time electric motor is started in star and switched to the delta, thus starting on no load is achieved. When receiver pressure approaches 4 Kg/cm² the starting cylinder plunger moves in and butterfly valve opens fully, loading the compressor. A minimum pressure valve opens only at 4 Kg/cm², the compressor does not deliver air below 4 Kg/cm². During this range of the receiver, pressure starting cylinder plunger is fully retracted and at the same time, servo cylinder plunger is also retracted keeping butterfly valve fully open, delivering full air. In this condition blow down valve remains closed. During this range of receiver pressure, the proportional controller P2P sends a pressure signal to servo cylinder just closing it partially. When the discharge pipeline pressure rises above 7.0 Kg/cm², pressure switch operates. This causes the solenoid valve to open, permitting receiver air to flow to servo cylinder which then closes the butterfly valve, thus unloading the compressor is done. As there is no pressure in blow down the pilot pipeline, it opens, lowering the receiver pressure to 4 Kg/cm². When service line pressure drops to 6.8 Kg/cm², the pressure switch operates and the solenoid valve closes. This cut off a supply of air directly from receiver to servo cylinder opens the butterfly valve and puts the compressor on load. Now, the blowdown valve pilot line gets pressurized and closes. When the “Off” push-button is operated, the motor stops, subsequently the quick exhaust valve relieve the air pressure from the air receiver. Hence a chance of back pressure at next starting is avoided. This is all about the governing of electric screw air compressor. I hope, the information above will clear all your doubts and also you can now set the right pressure at right conditions.